Fr Tony Ruhan died on Sunday 23 December in Sydney, and was buried on 3 January. 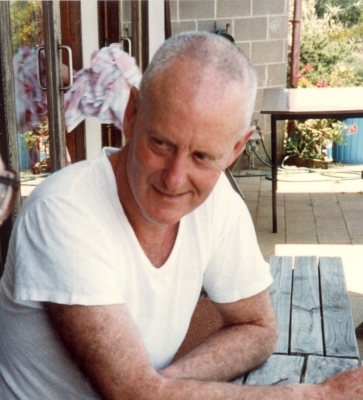 In this homily, Fr Peter Day reflects on a life lived in service. Of feet tired and sore and cut from the journey. Of the world’s hatred spewed onto the faces of the weak. ‘Who’s that bloke sweeping the floor?’ I asked a volunteer at St Canice’s soup kitchen, Kings Cross. It was in 1997 when I first encountered this ‘bright fella’ with his broom — and I remember well that his sweeping was anything but perfunctory. This was a sacred action because manual work is good for the soul. This was a sacred action because to serve is to pay homage. For Tony, sweeping that floor was tantamount to praising God. No wonder his ‘prodigal’ dedication to such a menial task. ‘God’, says Pope Francis, ‘shows the poor his first mercy.’ (Evangelii Gaudium, no. 198) And this first mercy is well known to each of us. Whatever one may feel about this dream that triages the marginalised as a priority, we should be careful not to patronise it as noble sentiment; or dismiss it as a niche aspiration for the specialised few — a kind of ‘soup kitchen’ social work. ‘In order for Christ to increase, I must decrease’, said John the Baptist. Tony took these words to heart. A poor church for the poor, like any divinely inspired dream, invites us beyond what is familiar, what is safe, what is comfortable. This is a disturbing prospect, especially for a wealthy, well-meaning young man — and Church — looking to our Lord for some consolation, for an easier path. And who is it that calls us out and rattles our inner being, but Jesus the Christ who bent down at the foot of humanity to show us the way? Jesus became poor. His foot washing ways established the template for Christian leadership: to serve from a place of humility and vulnerability; a place that too many of us have been loath to visit ever since. Tony had little regard for honorifics, or status, or personal achievement — he counted his own academic accomplishments as little more than ‘straw’. Who’s that bloke sweeping the floor? That’s Tony Ruhan: on his knees before others, for Christ is there. Fr Peter Day is assistant priest at Queanbeyan Parish in the Canberra-Goulburn Archdiocese. at Redfern (Sydney), aged 90 years. 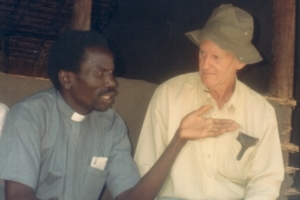 Tony Ruhan (right) in Sudan. 1947-48 Novitiate at Loyola College, Watsonia, Vic. 1949-51 Philosophy at Loyola College, Watsonia, Vic.